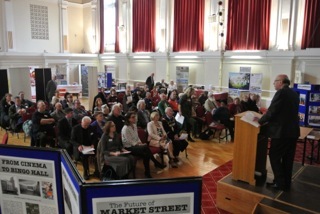 The Community Archives and Heritage North West regional Conference took place on Wednesday 15th October. 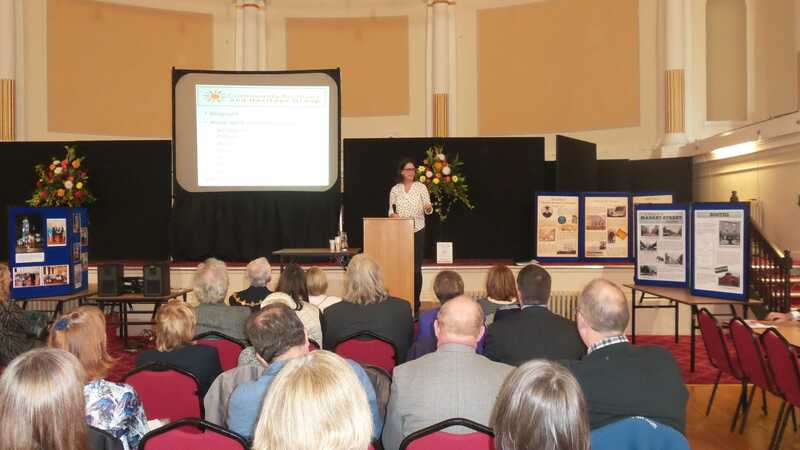 Hosted by the Chorley Heritage Centre Support Group (CHCSG) the conference was held in the Lancastrian Suite of Chorley Town Hall and was attended by over 70 Delegates. 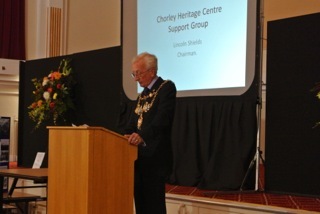 The conference was formally opened by the Mayor of Chorley followed by Lincoln Shields, Chair CHCSG, who talked about the group gaining accreditation status and since winning the ‘Best New Archive’ CAHG award for 2011 how the group has grown from strength to strength. Julie Creer, Community Archive and Heritage Group Treasurer, then gave a brief background of the organisation before going through the key features of the CAHG website. She invited delegates to join CAHG and to consider nominating their groups for the Community Archive & Heritage awards. Julie then introduced her colleagues from Lancashire County Council. Neil Sayer, Archivist, Heather Davis, Conservator, Fiona McIntyre Community Heritage and Andrew Schofield from the North West Sound Archives. All of whom talked about their collaboration with local community projects. The Heritage Lottery Fund offers a range of different programmes with grants starting from £3,000, all of which are suitable for community archive projects. Rebecca Mason, Development officer HLF talked about the project outcomes that HLF look for from a community project, the benefits of working with ‘professional’ heritage partners and the current HLF funding streams. During lunch delegates had a chance to network and browse stalls, displaying current projects and information about set up by some group. Bill Walker, CHCSG opened the afternoon session. Bill talked about the collaborative work the group have done with History students and the University of Central Lancaster (UCLAN). The students and the CHCSG volunteers have produced numerous displays and exhibitions; both parties learning new skills along the way. 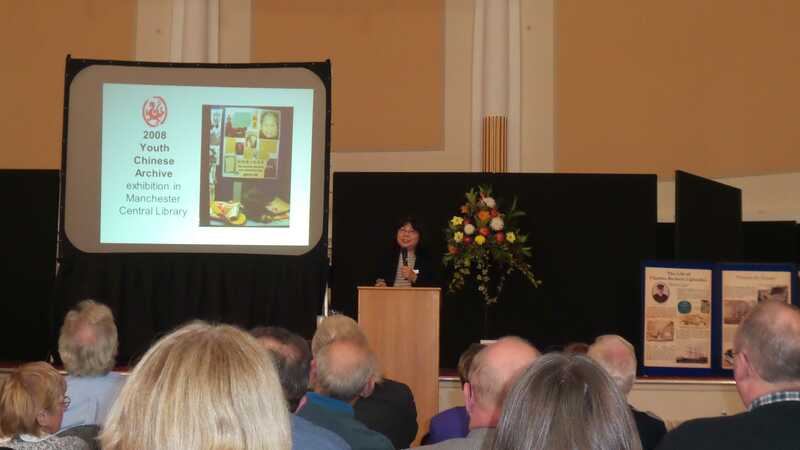 Jenny Wong then spoke about the challenges faced in the early days, when trying to set up the Manchester Chinese Community Archive. This was a very insightful and inspiring talk from Jenny who through overcoming some adversity, breaking down barriers, hard work and patience succeeded in establishing a vibrant and meaningful oral history archive. Cath Ford, Mid Pennie Arts was the last speaker of the day. Cath talked with passion and pride about the ‘Portraits from the Past’ community project. Her emphasis was about the energy generated and the ‘can do’ attitude when working with both professional heritage partners and the local community. This was a truly collaborate community project. 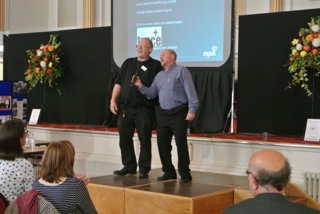 Finally delegates were entertained with Lancashire folk song and poems from Sid Calderbank and Mark Downing both members of the Lancashire Society before Julie Creer and Lincoln Shields closed what was a very enjoyable and thought provoking regional conference. Thanks must go to the CHCSG volunteers who did a marvellous job in organising the room layout, serving tea & coffee and Chorley cakes throughout the day along with overseeing the smooth running of lunch. This page was last updated on 27 October 2014.